Not-to be-missed, offer your group an exceptional experience above the rest! 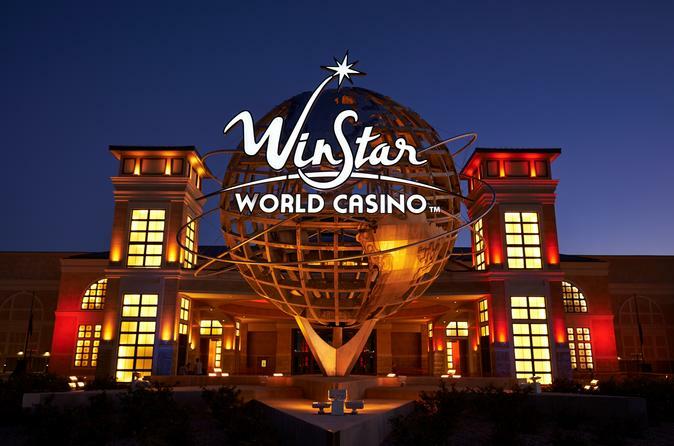 Knock another state off your bucket list and experience the world with a trip to the United States' largest casino, Winstar World Casino, located in Oklahoma 90 minutes north of (DFW). Amidst its luxurious decor of historical displays and architecture of Paris, Beijing, Rome, Madrid, London, Vienna, Cairo, and New York City, you'll have access to over 7,400 electronic games and various table games to enjoy at your on leisure. Enjoy $25 in rewards (Each new Players Club Passport members only) which can be used to spin the reels, purchase food or drinks, or shop, all as you partake in fun-filled casino games and entertainment! This private tour accommodates small groups of up to 11 passengers, and also includes complimentary pickup from your local DFW area home/ hotel, or local airport. Start the tour off with a complimentary pickup from your Dallas/ Fort Worth area hotel, or local airport. Relax and take in the incredible views of Texas as you travel through Texas to the Oklahoma border. On arrival to the border, you will begin to cross over the Red River which separates Texas from Oklahoma. From there you can't miss the large glowing signs and monstrous structure of a building, Winstar World Casino, "you are here!" At your leisure, enjoy over 7,400 electronic games spread across eight gaming plazas amidst luxurious decor of historical displays and architecture of Paris, Beijing, Rome, Madrid, London, Vienna, Cairo, and New York City to table games like poker, Ultimate Texas Hold ‘Em, Blackjack, Baccarat, card-based craps and roulette, Pai Gow, and the annual multi-million dollar River Poker Series, plus off-track betting and bingo. Take time to shop at Le Fleur Boutique’s upscale designer brands and Bedré Fine Chocolate, and find trendy accessories and sundries at The Isle and Essentials, as you partake in casino fun. Upon the time of departure, head back to the Rome entrance (point of arrival) where your driver will be waiting. As you load back up on your shuttle, sit back and relax as you enjoy the incredible views and reminisce about your casino tour as you enjoy the worry-free road trip back to your original point of departure.